As of 1930, Milton Goldsmith and his wife Sophie and daughters Rosalind and Madeleine were all still living together in New York City. All that would change in the next decade. 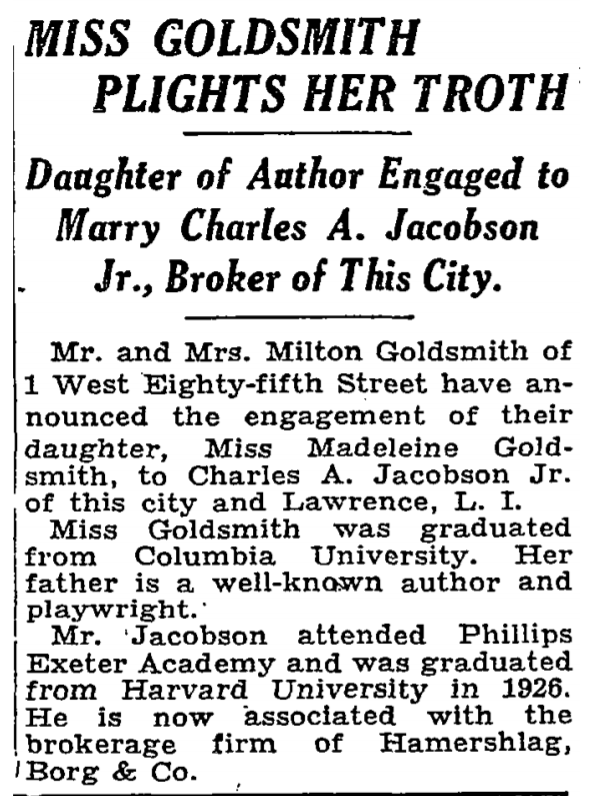 On September 29, 1933, Milton’s younger daughter Madeleine married Charles A. Jacobson, Jr. in New York City.1 Charles was a native New Yorker, born on February 8, 1905 to Charles A. Jacobson, Sr., and Emily Metzger.2 His father was a linen merchant. In 1930 Charles, Jr. was living with his parents and brother James in Lawrence, New York, on Long Island. His father was now retired, and Charles was a stockbroker. His brother James was a book publisher.3 According to the engagement announcement in The New York Times, Charles was a graduate of Phillips Exeter Academy and Harvard. Madeleine was a graduate of Columbia University. “Miss Goldsmith Plights Her Troth,” The New York Times, September 5, 1933. In 1940, Milton was living with his daughter Rosalind in New York City at 136 West 75th Street. He was now 78, and she was 38. Neither listed an occupation on the census. 5 Madeleine and her husband Charles were also living in New York City; Charles was now working as a banker.6 They would have one child in the 1940s. Later that year, Rosalind married Michael Zale on October 25, 1940, in New York City. 7 From 1942 until 1960, Michael Zale is listed in the New York City telephone directories at 136 West 75th Street, so I assume he moved into the apartment where Rosalind had been living with her father prior to her marriage. But I was having no luck learning anything else about Michael Zale. The only records I could find were the listing in the NYC Marriage License Index cited above and those telephone directory listings. There was a Michael Zale in the Social Security Death Index who died in November 1968,8 but I wasn’t convinced it was the same person since that Michael Zale was born on October 15, 1915, making him fourteen years younger than Rosalind and 25 when he married her in 1940 when she was 39. Rosalind’s obituary9 also mentioned that she was the widow of Michael Zale. But that was it. I couldn’t find one other record or mention of a Michael Zale anywhere. I searched Ancestry and FamilySearch using all the wildcards and variations I could think of. I searched the various newspaper databases—the New York Times, GenealogyBank.com, newspapers.com, and FultonHistory.com. I tried Google. Nada. Nothing. I was completely stumped. So I turned to the genealogy village for help. And Heather in the Tracing the Tribe Facebook group came to my rescue. She found a death notice for Michael Zale in the November 5, 1968, New York Times that broke down the brick wall. The New York Times, November 5, 1968. Now we knew that Michael’s father was named John, but nothing more. And I couldn’t find a John Zale either. But again Heather found what she hoped was Michael’s family on the 1940 US census: John and Olga Zalefsky in Brooklyn living with two children: Karl, 16, and Dorothy, 4. John and Olga were both born in Russia, John was an alien and Olga was naturalized. John was working as a bottler in a dairy.10 But was this in fact Michael Zale’s family? From that point, I started searching for John and Olga Zalefsky and found them (as Zalifsky) on the 1930 US census,11 where they were living with four children: a six year old son Karl, a ten year old son Roosevelt, and a fourteen year old son whose name appears to be Metre. Could this be Michael Zale? The age was right (Michael would have been fourteen going on fifteen when the census was taken in 1930), and the name started with M. Perhaps John and Olga had given him a more Russian name that he later Americanized. John and Olga had immigrated in 1914, according to the census, and were still aliens. John was a laborer in a dairy. Moving backwards, I then found them on the 1925 New York State census as John and Olga Silefsky with three children, Carl (one), Roosevelt (5), and a daughter named Metra, age nine.12 Was this a mistake? Was the oldest child a girl, not a boy as indicated on the 1930 census? Was this not the right family at all? I wasn’t sure. And so far I’ve had no luck finding them on the 1920 census or the 1915 census. And although I found birth records for Karl and Dorothy, I have none for Metra/Metre or Roosevelt. Meanwhile, Heather found a great deal of information about John and Olga’s other children and found some living relatives. I have written to them and hope that they can tell me whether the Michael Zale who married Rosalind Goldsmith was the son of John and Olga Zalefsky. For now, I can’t be sure, but I am hoping they respond and can help to clarify the conflict between the 1925 and 1930 census and tell me more about Michael Zale. In the meantime, I will continue to search for more information about the Zalefsky family. Thank you so much, Heather, for all your help! One final post on Milton and his family to come. This entry was posted in Genealogy, Goldschmidt/Goldsmith, New York and tagged Goldsmith, Milton Goldsmith, New York City, Zale, Zalefsky by Amy. Bookmark the permalink. Heather is a gem! But I wonder how Rosalind met the blind Michael. Could she have been volunteering somewhere? I don’t know, but I sure wish I did. And I am not even certain he was blind—but someone in the family must have been. I still haven’t heard from Milton’s grandchild and still hoping I will. I hope you do hear from his grandchild. Good luck! I’m Sue and I am Milton’s grandchild. Rosiland, my Aunt Ros, and Michael, Uncle Mickey, met at the Lighthouse Camp for the Blind where she did volunteer work. As a child I always assumed that he also worked there it is only more recently that I realized he might have been a camper. He wore thick glasses but was not actually blind. He could see well enough to navigate where he was going and I think he read to me when I was a child but I’m not sure about the reading. I hope the relatives are able to fill in some blanks for you. So glad Heather was able to help! Me, too, Debi! Thank you! Wow. That is some serious sleuthing. The search anomalies are very interesting to me, as I’ve been searching for obituaries for my great-great grandparents and coming up totally dry. Maybe day by day searching would work. Also, do you know of any archives for Yiddish newspapers in NY? Thank you. I’m coming up empty in the NY and NJ papers in English, so thought I’d explore the Yiddish angle. Do you know Yiddish? I don’t know whether these papers are translated. I certainly can’t read Yiddish! Ha! No, not at all. I would be pattern matching names like a monkey, then getting a translator involved if I found anything promising. I hope it works out—I have done a little of that with Old German script. Quite a challenge! Yeah, my hopes are low, but I’m willing to try anything at this point. What are you looking for? What kind of information? Maybe I can help?? 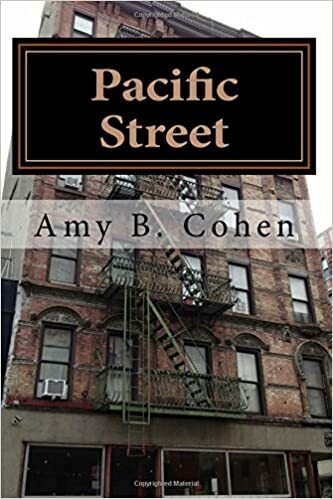 Thank you, Amy! I’m trying to find obituaries for my great-great grandparents in the New York / New Jersey areas. In one case I know the death year was 1924 ( https://peopleofpancho.com/2014/06/04/hermans-sad-homecoming/) and in the other (Franziska “Fanny” Spielmann / Spellman) I have a suspected date range only. The end goal here is to locate their graves, but the route there is proving to be rather circuitous. Do you have their death certificates? I assume not. Why don’t you email me the details, and I will see if my “fresh” eyes can find something? Will do. I’m about to head off on a business trip, so it isn’t likely to happen until the weekend, but thank you! Your search for the ‘mysterious son-in-law’ shows that team effort and a variety of search methods lead often to greater success than going it alone. Good luck in solving the mystery, Amy! Thanks, Peter. It’s one of the things I enjoy about genealogy—how much we help each other. It was the New York Times website, which is not very user friendly for searches. I called them today and learned that to search by date, you need to be a subscriber and search on a different site than their main site. I am a subscriber, so I can do that, but even that is not a particularly good search engine. I use that one also as well as newspapers.com, ChroniclingAmerica, and fultonhistory.com (which seems to be down at the moment). And then I also search local papers if I can. There are also some other free database; for example, there is one for Jewish newspapers in Pittsburgh. Good luck! Amy, I hope you hear back and that they have helpful news for you. Wow, it’s so odd how some people are so hard to find whereas others have a surfeit of info available about them. But when you consider all the misspellings. Plus, I do think that some of the newspaper databases are very flawed. It’s about using the right search terms, and sometimes the name itself doesn’t work, so you need another word, but WHAT? I agree—sometimes those news databases are quirky, the NYTimes in particular. But it is still so worthwhile when you do find articles. There was a good obituary of my father ,Charles Jacobson, in the Mamaroneck Daily Times. I don’t know the exact date of the obit but is should have been in late November 1983. I’m new to Ancestry.com and don’t yet know how to search obituaries. I’m also not sure I have time to do a lot of research. I’d love to know if anyone finds it. I will look for it. I probably did already, but will check again.